Clear images of minute packages meant to shield healthy cells from potent anti-cancer drugs have helped researchers evaluate a promising of new approach to chemotherapy. The drug cabozantanib, also known as XL184, effectively combats several kinds of cancer but like many chemotherapies causes so much damage in healthy tissues that doctors must limit doses or even suspend treatment periodically to allow patients to recover. To allow a more sustained attack on tumors, a team led by Tayyaba Hasan at Massachusetts General Hospital wrapped drug particles in membranes meant to protect non-cancerous tissues from their effects. They spiked the membranes with molecules that react to infrared light, which penetrates quite deeply into the body, by releasing the drug at the site of a tumor. The approach seemed to work in a mouse model of pancreatic cancer. But the scientists needed to know how well their wrapping procedure really worked. For a better view of their particles, they turned to a team at UC San Diego led by Elizabeth Villa, a professor of chemistry and biochemistry. 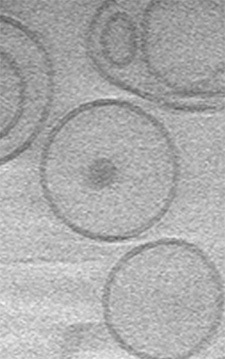 Villa’s group uses a form of electron microscopy called cryoEM that avoids the need to dehydrate samples and stain them with heavy metals by flash freezing them to better preserve their natural structures. Using the Department of Chemistry and Biochemistry’s cryoEM facility, Reika Watanabe captured images of the particles in three orthogonal planes to reconstruct the structures in three dimensions the same way a CT scan does with X-rays. A new, sharp camera provided exceptionally clear images of the protective packaging. Although the researchers intended to wrap each drug particle in a double-layered membrane like the ones that enclose cells, a surprising percentage were not, yet they caused less collateral damage than the unprotected form of the drug. 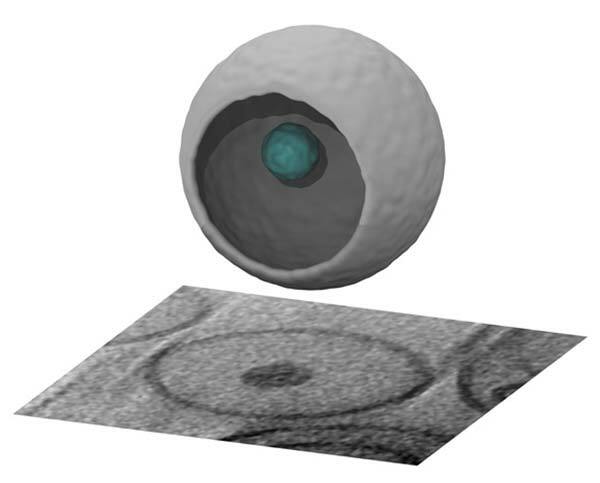 Instead, many drug particles seemed to be wrapped in a single layered membrane, a form called a micelle, which gives the researchers an additional strategy to pursue. Nature Nanotechnology published a report of this work by corresponding author Tayyaba Hasan, a professor of health sciences and technology at the Wellman Center for Photomedicine, Massachusetts General Hospital and Harvard Medical School. Co-authors in addition to Watanabe and Villa from UC San Diego included Bryan Spring (now at Northeastern University), Bryan Sears (now at Emmanuel College in Boston) and Lei Zak Zheng who shared lead authorship with Hasan.